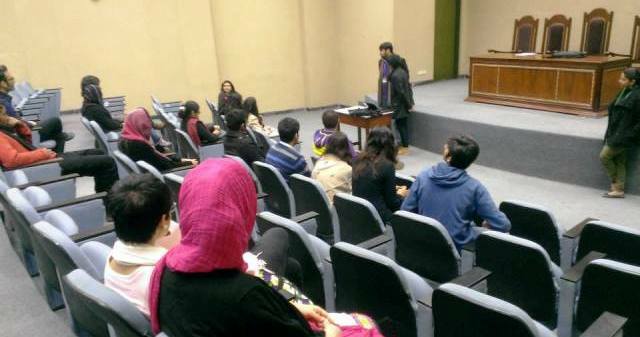 The Ewing English Society arranged a preliminary session for the students who got selected to volunteer at the Lahore Literary Festival. All the volunteers went through an interview which was taken by Ms Jacqoline J. Austin (Adviser), Gadhaun Aslam (President), Ekasha Najam (Media and Marketing Head), Neyha Edgar (Activities Coordinator) and Daniyal Umar (Event Manager). The session started off with an introduction of the Lahore Literary Festival and our society by Aneeq Sarwar (Vice President) who also emphasized on punctuality. Later on, the lecture was accelerated by Gadhaun Aslam (President) who highlighted the qualities of a good volunteer. He quoted ‘Amazing volunteers think less about what they can get from the experience of volunteering and more about what they can contribute’. Moreover he said ‘You should be able to take constructive criticism and improve your own skills in order to help others’. Daniyal Umar communicated about the responsibilities of the students as volunteers at LLF. He also encouraged all the volunteers to keep visiting the LLF website in order to get more updates. Neyha Edgar, voiced the volunteers about the dress code and being presentable. The session was summed up by Ms Jacqoline Austin who encouraged the students and assured them that LLF will surely turn out to be an amazing experience for all of them. 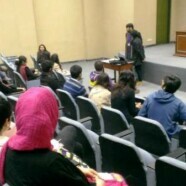 The students were told that the Lahore Literary Festival will be held from 21 to 23 February 2014 at Alhamra, Mall Road, Lahore.